From the 18th to the 22nd of July, ACVic Centre d’Arts Contemporànies collaborated with the municipal summer schools and CIVICUS Vic to create furniture and signposts for the green belt. 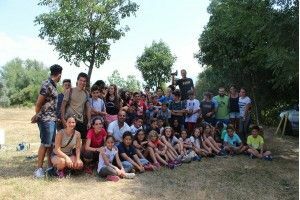 During the CIVICUS summer camp week, developed entirely in ACVic, about forty young people from 11 to 15 years attended, discovering what the green belt lacked and what was needed, and designing and building furniture out of reused materials; the end result being a table with benches. The M summer school, which was attended by about 20 children aged 9 to 12 years, took place at the Guillem de Mont-Rodon School and, at certain times, moved to ACVic. They were responsible for wooden signposting about the wildlife which may be found in the green belt. The workshop was taught by Carles Arumi and Jordi Arevalo, with the collaboration of educators from the two summer schools.